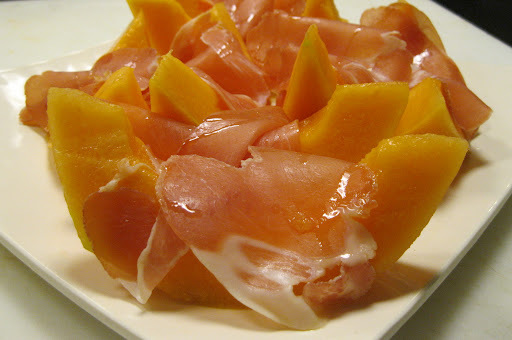 In Italy, you’ll certainly dine on an appetizer of ‘prosciutto e melone’. Melon is served in large pieces, draped with prosciutto slices so thin, it’s almost translucent. Prosciutto is cured and salted Italian ham, from the pigs hind parts (legs and thighs). It’s quite expensive so savor each bite. You can get freshly sliced Prosciutto di Parma, in specialty deli’s. Order by the slice, think 2 slices per person. Don’t be afraid to ask for a sample. This is not the time to think local, buy whichever tastes the best to you. Foodie note: Make sure they don’t charge for the papers that separate the meat. That happened to me once at a very nice deli and I ended up paying twice the price. I think it ended up costing $2.50/slice… the paper was heavier than the meat! I was not pleased. On a serving platter, arrange cantaloupe. Drape prosciutto slices over melon and drizzle with good fruity olive oil. Serve at room temperature.